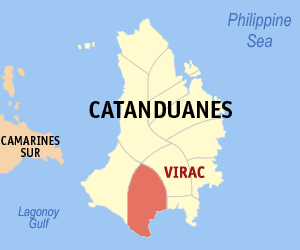 VIRAC, Catanduanes –Three persons are now in the custody of the Philippine National Police (PNP) after they were arrested for violation of R.A. 9165, otherwise known as the Comprehensive Drugs Act of 2002. The arrest was made by virtue of a Warrant of Arrest issued by Judge Lelu P. Contreras of Branch 42, Regional Trial Court, in Virac, Catanduanes. The arrested suspects were idedntified as Liza Posada y Salvacion, 48 years old, married; Raymund Posada y Salvacion a.k.a Boboy Palaad, 24 years old; and Rey Posada y Pareja, 46 years old. The three are all residents of Sitio Pulang Lupa, Barangay Lanao, this municipality. In the investigation report, it was revealed that they were all collared by the authorities at around 6:30 in the morning at Barangay San Pedro, here.